Do you like mysteries? Have you heard about the “mega mystery” of all creation? In Ephesians 5:32 the Bible talks about a “mega mystery” being foreshadowed by Adam and Eve as well as by husbands and wives, “the two shall become one flesh” (Genesis 2:24 and Ephesians 5:31). It is not just a “mystery”, according to the Bible, but a “great mystery” – a “mega” mystery in the Greek. With this in mind, let’s consider the following. We have written before in these letters about a mysterious relationship that keeps showing up in God’s Creation. It occurs in many created forms in nature that we consider beautiful. It is, for example, the basic ratio in the dimensions of the human hand and the human face. And it occurs in mathematics in a uniquely elegant and mysterious manner. This is the Golden Section, ϕ or Phi, also known as the Golden Ratio or the “Divine Proportion” as it was first called by Leonardo Da Vinci. It is the proportion defined by the illustration to the right for a line of any length. Stay with me here for a minute to consider the truly remarkable connection between a mysterious signature feature of creation and the “mega mystery” of the Bible! The Divine Proportion (Golden Ratio) is an infinitely continuing value ϕ = 1.6180339887…/1 – what mathematicians call an irrational number. The Proportion is itself mysterious in how it functions. For one thing, its inverse, 1/ϕ, is 0.6180339887…, the exact same decimal digits! Its square, ϕ2 is 2.6180339887…keeping again the exact same infinite decimal digits and being exactly the sum of the two normalized lengths within the Ratio, 1 + 1.6180339887… ! Starting with squares that are extended into “Golden Rectangles”, you end up making a number series with a peculiar unique sequence to the ratioed lengths of their sides (diagram at right). Arcs drawn to connect the corners of these squares within the Golden Rectangles form what are called a Golden Spiral, also very common to nature and to natural beauty! 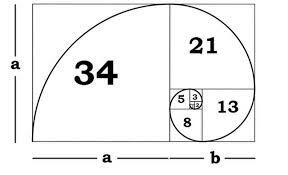 Phi, the Divine Proportion, is thus connected to a peculiar mathematical sequence of numbers, a number series which is used to construct Golden Spirals from Golden Rectangles in the manner described above and depicted at the right. Interestingly, the same series of numbers is also formed by adding two whole numbers to become the next. Beginning from the origin, this gives the series 0, 1, 1, 2, 3, 5, 8, 13, 21, 34, 55, 89, 144,…continuing to infinity where two adjacent numbers add to become the next. It’s called the Fibonacci series after the Italian mathematician Leonardo Fibonacci. When you take the ratio of any two adjacent numbers within the series, you find their ratio converges to the Golden Ratio, Phi. For example, 21/13 = 1.61538…, and 144/89 = 1.61797… getting ever closer by more and more significant figures to a more and more precise value of the Divine Proportion the further out in the series you go. Why should that be the case? And the interesting thing is that the numbers in this series, just like with the Golden Ratio and Golden Spirals, also appear with high frequency in nature. For example, look at your hand. Not only is its length-to-width ratio roughly a Golden Ratio, but you have 5 fingers, 3 knuckles on each finger and 2 knuckles on your thumb. And the ratio of hand bone lengths from fingertips to each knuckle all the way to the wrist are in the case of each finger 2 to 3 to 5 to 8 – all numbers in this series of the Golden Ratio. The Golden Ratio, this Proportion that to great artists and thinkers like Leonardo Da Vinci appears to have Divine status, is intimately connected with a number series that is formed by two numbers adding together to become one more – starting from the origin! This is quite intriguing from a biblical point of view of the “mega mystery” we mentioned at the beginning – “the two shall become one”, connected by a mathematical definition of wonder and beauty. It’s as if the Creator has connected His Creation with multiple applications made beautiful by a Proportion that is at the heart of something even more mysterious regarding the beauty of intimate human fellowship and His Own connection to us! “For this cause shall a man leave his father and mother, and shall be joined unto his wife, and they two shall become one flesh. This is a great mystery, but I speak concerning Christ and the church” (Ephesians 5:31-32) . The first sentence quoted above is essentially a quotation of Genesis 2:24 with the creation of Eve out of Adam’s side, “they shall become one flesh”. As we look back on the revelation of Scripture, Adam and Eve were indeed a reflection of Christ and the Church from the beginning. God’s creation of Eve out of Adam when Adam was in “a deep sleep” is a picture of God’s formation of the Church out of the death of Christ. In fact, Scripture describes Christ as the second or last Adam (Romans 5:12-19 and 1 Corinthians 15:45). The difference is that Adam’s DNA, his seed in the flesh, drives us to sin – through Adam we inherit the sin nature. But in Christ we inherit a life-giving spirit, a spiritual “seed that cannot sin” residing in us who are “born of God” (1 John 3:9). So here we have a betrothal, a marriage in the making, between the risen Jesus Christ and his redeemed Church, the community of individual believers who each carry within us not only the seed of Adam – and are, therefore, human beings – but the spiritual seed of Jesus Christ! In effect, His “DNA” is in us, and it makes us a part of His body as DNA in each cell of our body makes it part of our body. Our essence, seed, is in every part of our body. And His essence, seed, is in every part of His body! This is intimate communion with our Creator. And it is a marvelous, beautiful and wonderful thing! P.S. This month I’m excited to bring you a wonderful book that has become a favorite of mine as well as many of us here at Creation Moments. 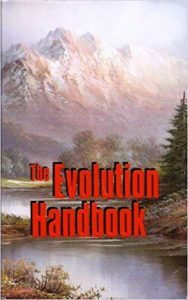 Without a doubt, The Evolution Handbook is the most complete refutation of evolution available in a single volume! Within its nearly 1,000 pages are chapter after chapter of pure scientific truth, disproving virtually every basic area of evolutionary theory. Open this book at any page to learn more about a far wider range of scientific facts than most scientists are ever taught! As you know, kids are walking away from the church in record numbers, and much of the blame can be laid at the feet of evolution. So I want you to think of this book as an essential resource that will make evolution look ridiculous in the eyes of every person who reads it. Plus, everyone in your family will learn compelling evidence supporting biblical creation. I will be happy to send you The Evolution Handbook for a tax-deductible donation of $30 or more. Plus, I will send to you – or to anyone who makes a donation of any amount – our very latest CD of Creation Moments broadcasts. Simply click here or call us toll-free at 1-800-422-4253 during regular office hours … and I will have these items shipped to you without delay. Thank you so much for making our ministry YOUR ministry! We’re still not out of the summer “donations doldrums”, so your financial support and prayers are especially appreciated!